Thanks to PlayStation for hosting these videos! Part One was posted two weeks ago and Part Two was posted a week ago and I only now learned about both! I have to step up my google searches! In fact, I almost didn’t realized there was a Part Two! Another great developer interviews with Art Director Robert Craig, Audio Designer Hywel Payne, and Animation Director Jamie Galipeau. A lot of time is being put into making sure the water sounds like water and the boat feels like being on a boat. The biggest take away is that I haven’t missed a dev diary episode AND THE GAME COMES OUT IN SUMMER 2019!!! I knew it wasn’t going to be December 2019 but I can’t wait to spend time with the game, probably in July or August, right? 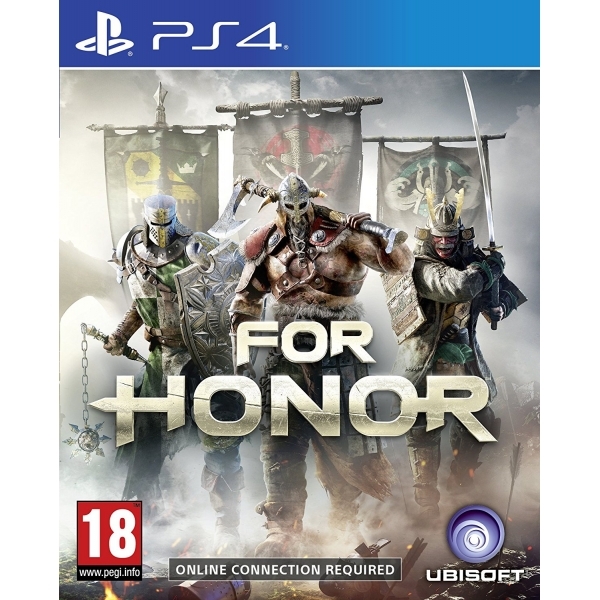 Amazon still has it listed for December 31, 2019 but that makes sense. 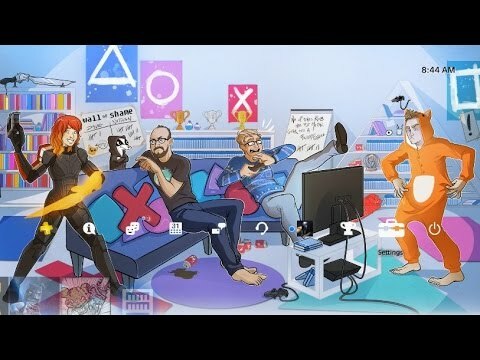 Thanks to PlayStation Access for hosting their own video! I saw the beginning of this seven months ago but I wasn’t addicted to their channel then so I was pretty dismissive. Now I’m all about Rob and Hollie and their is a lot of content in this video to enjoy. I really like the design of the compass decision making interface, that looks really cool. I wonder if the plan is to still release two games a year? I know the game isn’t supposed to be Until Dawn’s ten hours, it will be more like five hours, and $30 isn’t that bad for what I’m hoping is a lot of content and plenty of replays. I can see them releasing one game this year and then maybe two next year, once they know what the demand is for the Dark Picture Anthology. I’ll be buying all four games, that part, I’m sure about. Especially if they stay at the $30 range. I should look into what actually is required to upload game footage as that would be very fun to make a Let’s Play video of my first playthrough. Who ranks the game on their list of 10 2019 Games that will Change Everything! I still say Man of Medan is my most anticipated game of 2019. Still surprises me that no one has made a subreddit for the game. Maybe once there is an official release date. Turns out, someone has made a subreddit for the game! I was about to do it myself but now I don’t have too. Though there was only two posts in there and I’m trying not to flood it with videos but the first post was from three months ago with one comment and another was from a month ago with zero comments so I’m trying to bring some life to it. Well, I finally did it! 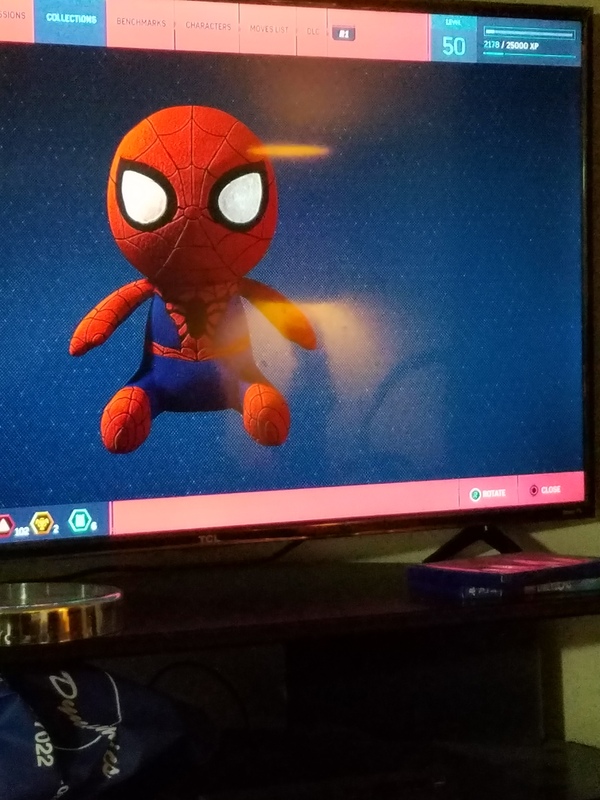 I completed my Ultimate New Game Plus run of Spider-Man PS4! I thought the Doctor Octopus fight was going to be hard but I kept dodging and web attacking and he went down in a quarter of the time it took me to do the first time. The first time, I just kept trying to throw things at him and kept my distance. This time, I stayed close and kept webbing his arms and launching myself at him. 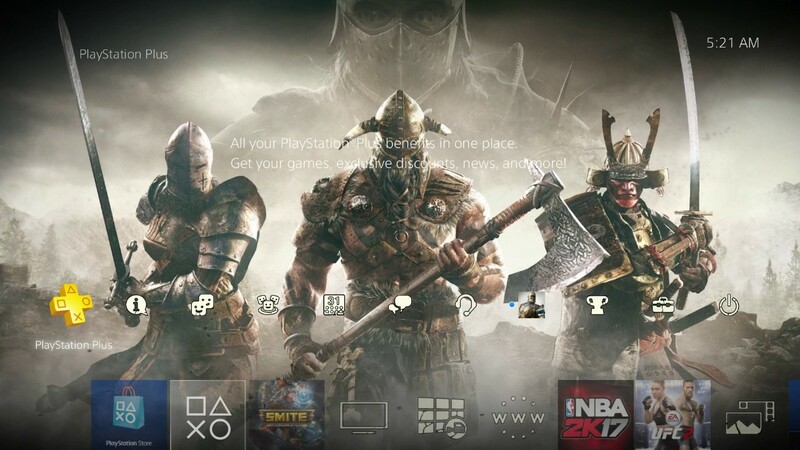 I was going to share the image getting five 100% of the game but I didn’t get all five lines to show up on the same screen. The Main Game / New Game + / CTNS : The Heist / CTNS : Turf Wars / CTNS : Silver Lining. I figured out how to take a picture of the PS App on my phone. If you want to know how to take a screenshot of your Android phone, press the power button and the volume down button at the same time. Pretty handy! I’ve started the second episode of Batman : The Enemy Within. I’m going to have Wayne tell ties and Batman be honest, if those options pop up this time around. Batman fought Bane, and I had the option to call either Gordon or Waller. I choose Waller as it was my first chance to try to make her happy and she said if I played ball, she will put Gordon back in charge once this is all over. He’ll be upset but he’ll understand the situation. 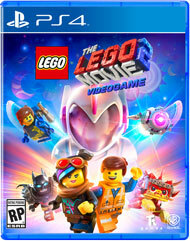 Still no word on when Lego Movie 2’s DLC is supposed to come. We were playing some of it last night and it is still a pretty fun game. We even played Lego Dimensions for a bit. I still really want to get the Fantastic Beasts pack, it is affordable and it would be a lot of fun. Plus, we have Green Arrow and Flash’s STAR Labs is a secret location and that’ll be fun to explore that area. $27 isn’t bad for a new (and our final) gateway and six proper story missions and three additional trophies. One of these days, we will own it. It took some searching before I could find someone who will sell it to me for five dollars. Some places wanted five dollars just to ship it and i couldn’t justify that. 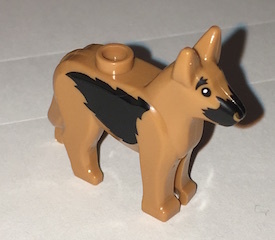 I bought it as I’m going to use it as Dogmeat from Fallout 4, and I’m crazy into German Shepards, because of Dogmeat. 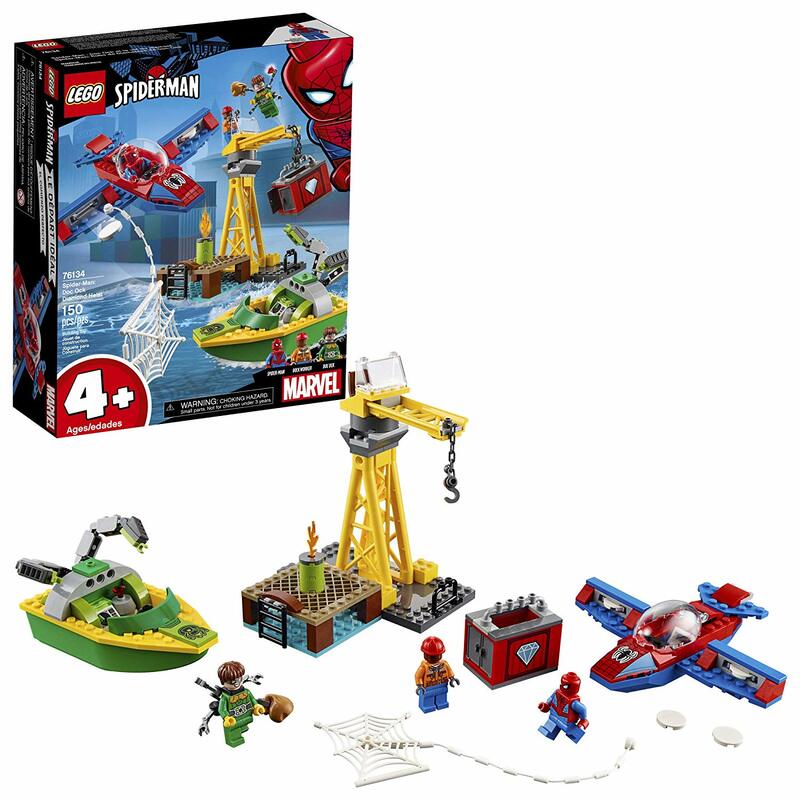 I was at Walmart and couldn’t find any sets that even had dogs so I had to look online. 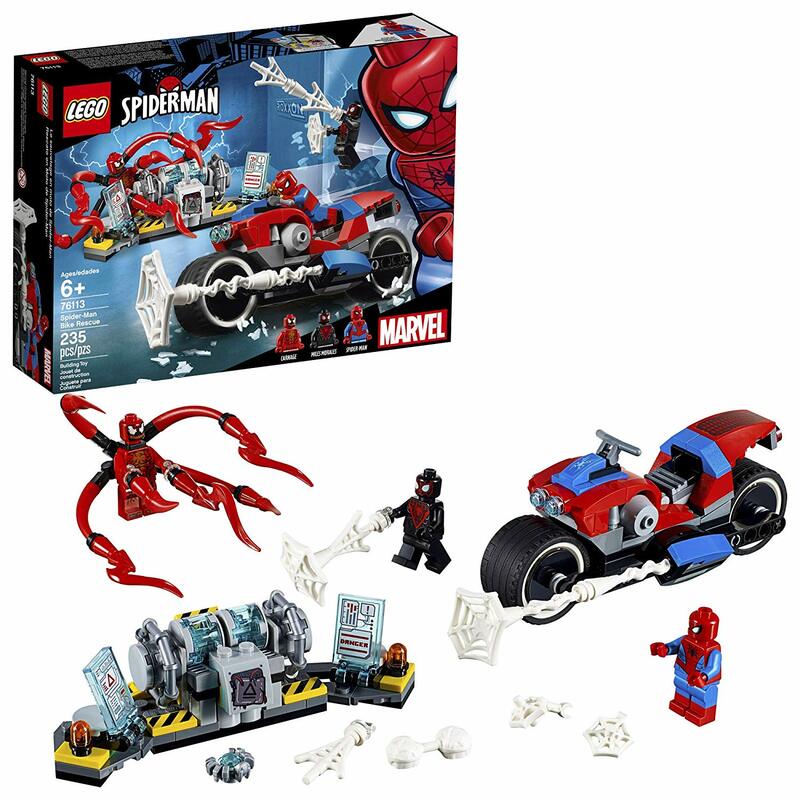 People highly recommend BrickLink and I totally see why now. Such a handy website! I’ve come to adore the lego subreddit. Dark_Movie-Director even posted links to all of the pieces to make his Sole Survivor which is super helpful. WordPress used to do a Year in Review until they stopped for 2017 but PlayStation does it and I love seeing my stats! I’m addicted to checking out the stats of the blog. I just like seeing the numbers. You could click on the link but I’m going to provide the information with some commentary. Which doesn’t feel right but I must have attempted several games. 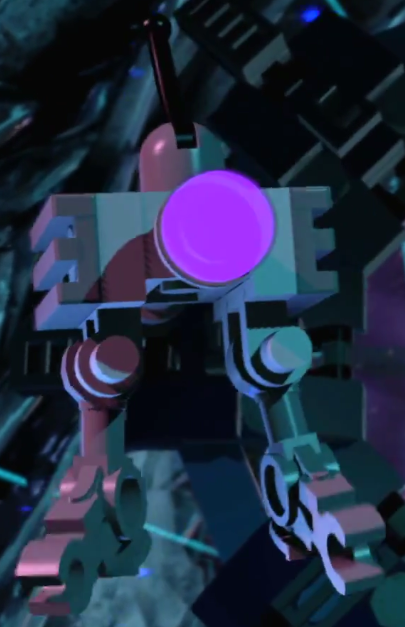 Lego Dimensions, I definitely share that time with Walker Dennis as he plays solo sometimes. Also, like his Kindle usage, he doesn’t turn it off so there will be times where he starts the game and then leaves the game on so he can play with his Legos and tries to incorporate the screen into his play or uses it as inspiration. But still, I imagine it is a legitimate 400 hours. I’m not sure what RPG is relating too, I waited to see if more stats were going to load but they never came. Did you know? Players made a total of 119,919,423 home runs in MLB The Show 18 last year? I wasn’t one of those. In 2018, I clocked in 1,065 hours in gameplay. Which seems like a lot! All of that time was spent locally, I have zero hours in online play and in VR. As I don’t play multiplayer nor do I have a VR headset. Which I’m not sure when that would have been as I can’t imagine playing for more than three hours in a row. Which makes sense as I usually try to play at night but I took off 52 days. Which doesn’t sound right at all, that must be Walker playing after school. Which does sound right as that’s when I get to play with Walker or I get to sneak in some gaming time by myself. Did you know Kratos was slain 924,757,695 times in God of War last year? I’m hoping to eventually play God of War and Horizon Zero Dawn at some point this year. HZD’s complete edition is usually $20, which is right in my price range. I just want to put a dent in my backlog before taking on another massive game. Which is super impressive! I love me an open world but there are times when I realized I spent more time in the world doing side stuff but that usually doesn’t amount to many trophies. But I like to think of myself as more of a casual trophy hunter. I’ll get the ones I want or am close to but I won’t necessarily grind for one, such as find 100 newspapers or something. Especially if collectibles are super hidden. I really did try my best to get Platinums this year and I’m impress with the ones I did. Did you know players drove a total of 7.3 billion miles in Gran Turismo Sport last year? I wasn’t one of those either. I downloaded 55 free games through PlayStation Plus last year. So if you are wondering how many free games there were, it was 55. Well, I didn’t get the PS3 games and I missed out on some Vita games. Now I wished I did purposely download the PS3 ones as one never knows if the PS5 will have backwards compatibility (hopefully it does!) and maybe we’ll get to play these older downloads again. I know I want to play my X-Men arcade game again and Scott Pilgrim too. I’m not sure what this one is in relation to as the only thing I bought was the Spider-Man : The City that Never Sleeps DLC but maybe I bought something else but I’m not sure what it would have been. Did you know there were 28 free PS4 games last year? I did as I got all of those! Including Call of Duty : Black Ops III. Those over 100 hours months must have been Fallout Shelter related! I was obsessed with that game. Most of those trophies have be bronze trophies but it does seem like a lot. I wonder what same six games I was playing? Lego Dimensions, Fallout Shelter (I stopped playing that back in September), and whatever my main game must have been. Knowing these stats might be coming, I really should attempt those free PSN games. I wish I could get more of a breakdown of what I played per month but I do like seeing the information in a table. I wished WordPress had a table mode as it bugs me that the lines are not fixed in place. I had to retype it in Excel to get it in a table format. It looks so much better now. Like, what happened in October where I got over a 100 trophies?! Those must have been some generous games. That must have been Uncharted 3, right? I had to go to my PSN Profile Page to get some answers, not many but some. Hidden Agenda was the main game in October, along with RiME, Ghostbusters, and Fallout Shelter. Four games that were pretty generous. Games usually start off with loads of trophies but a few give more at the end too, which makes sense on both sides. Here is what is coming to PlayStation in 2019! I’m not slated to play any of these but Days Gone does look good. I’m just not much of a zombie guy. 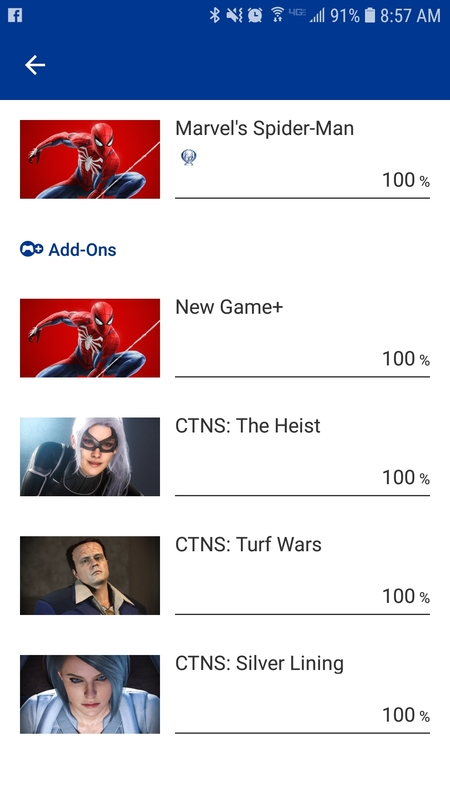 Like I wrote above, I got the platinum on Spider-Man, and I’ve 100% The Heist. I’m still having a great time. I must be towards the end of Turf Wars, as my percentage is in the 70s. 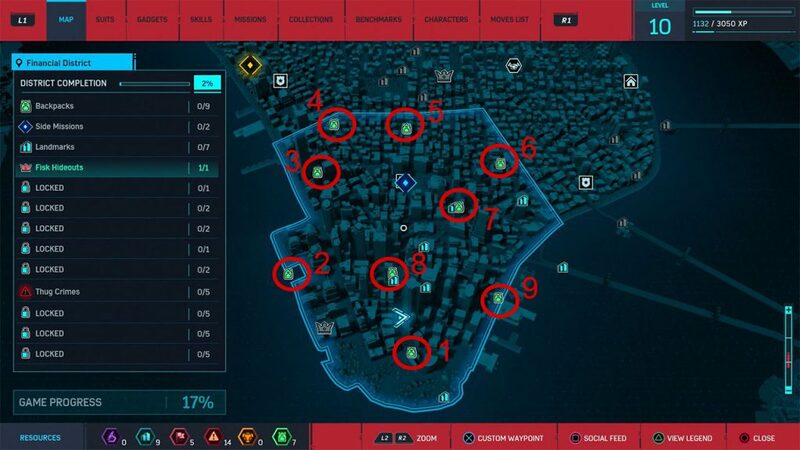 Using The Heist, I used the Black Cat costume exclusively. So that works for me. Maybe too red now that I’m looking at it. I’ll start off with it and see how long it lasts. 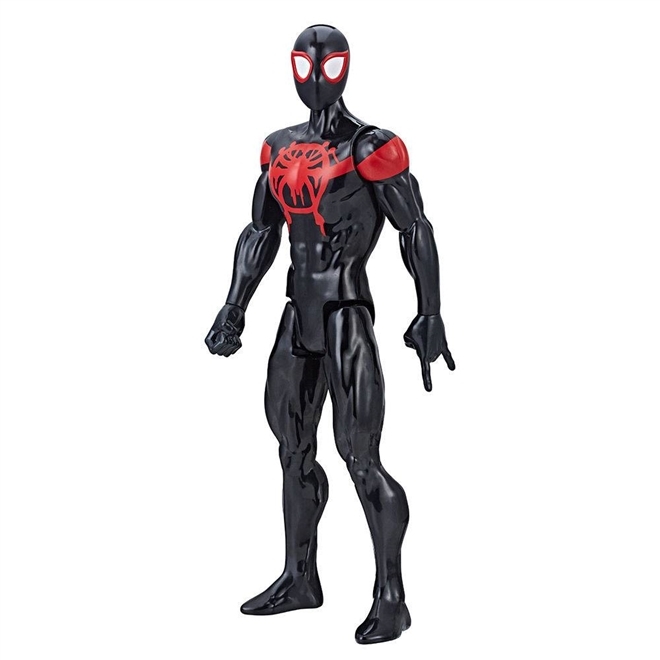 I was thinking the Armor Mark One suit would be an even better Sabre uniform but it is too late now. I have so many trophies while wearing the other one, I want to break it up. Thanks to polygon for hosting the images. Such a great gaming website. 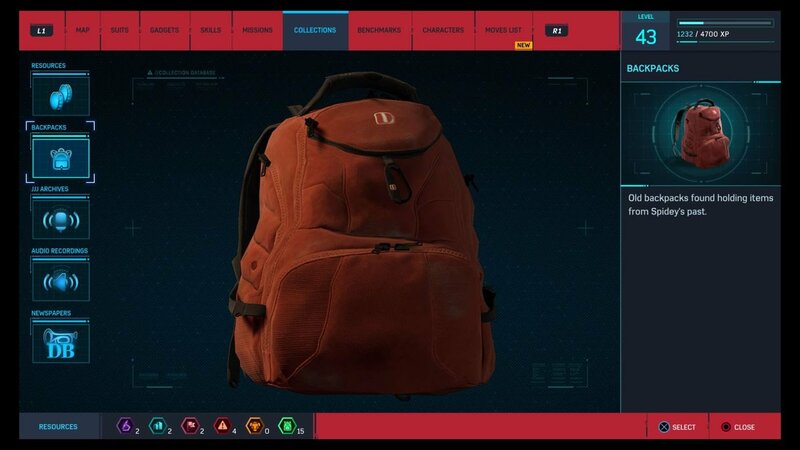 I used them a lot for Spider-Man and Fallout 4. 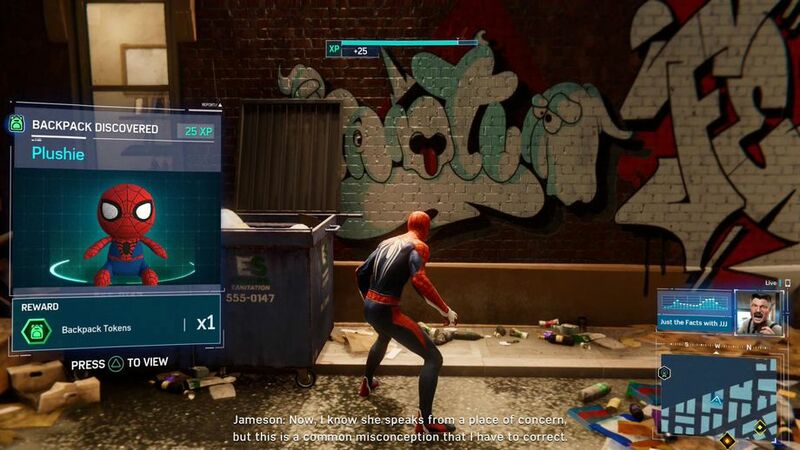 I like how they include the Silver Lining costumes as it seemed like once the game came out, some websites hadn’t updated with the DLC content or they stopped at Turf Wars. Having the Heist focused on Black Cat, and having a Black Cat provided costume, it just made sense to combine the two for the DLC. 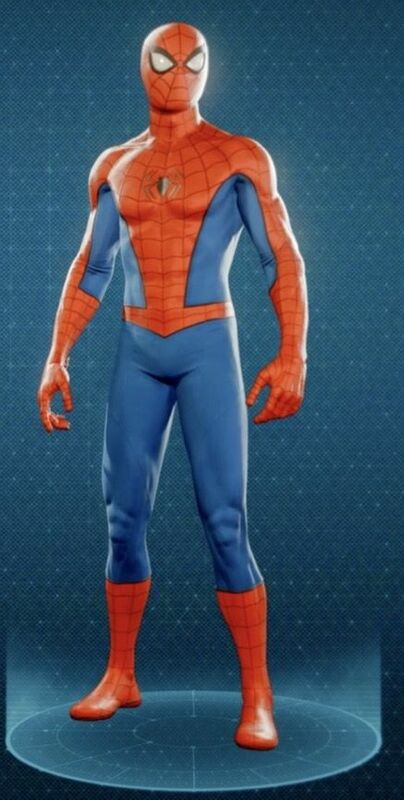 Since I was already having that thought, I wanted to one a main suit for each DLC. 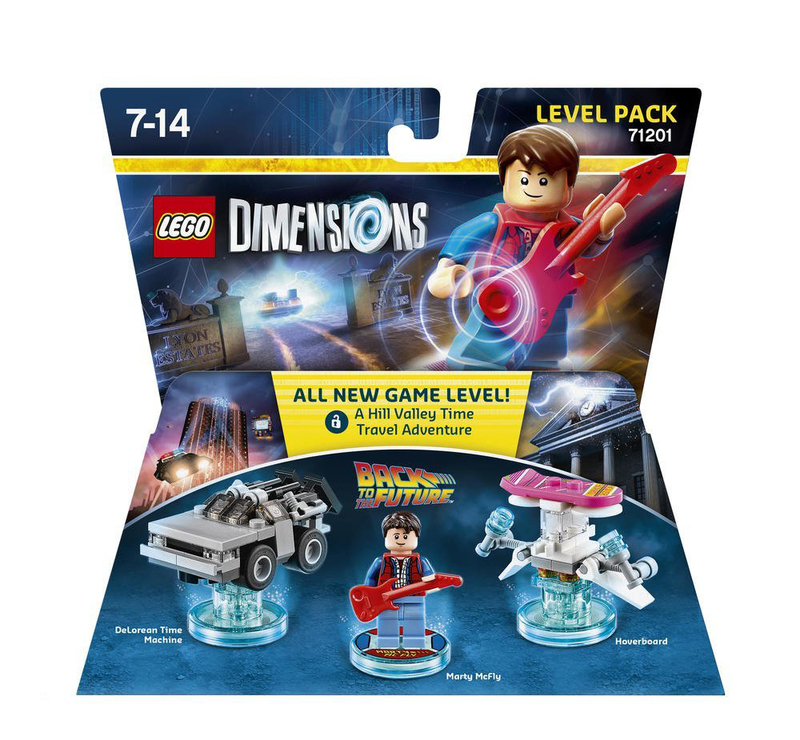 Walker has gotten Marty from LEGO Dimensions and we are having a great time cleaning up the minikits and rescue characters using the DeLorean. My beautiful wife got him Starfire, and we’ve been using her rainbow abilities to get other missing minikits. I had to make a list of all of the time traveling options we need to still do. During the level proper, I forgot to access the secret Dance location so we still have to do that. I also got him the Green Arrow exclusive pack, he didn’t unlock anything we didn’t already have but we like Arrow and I got him relatively inexpensively. 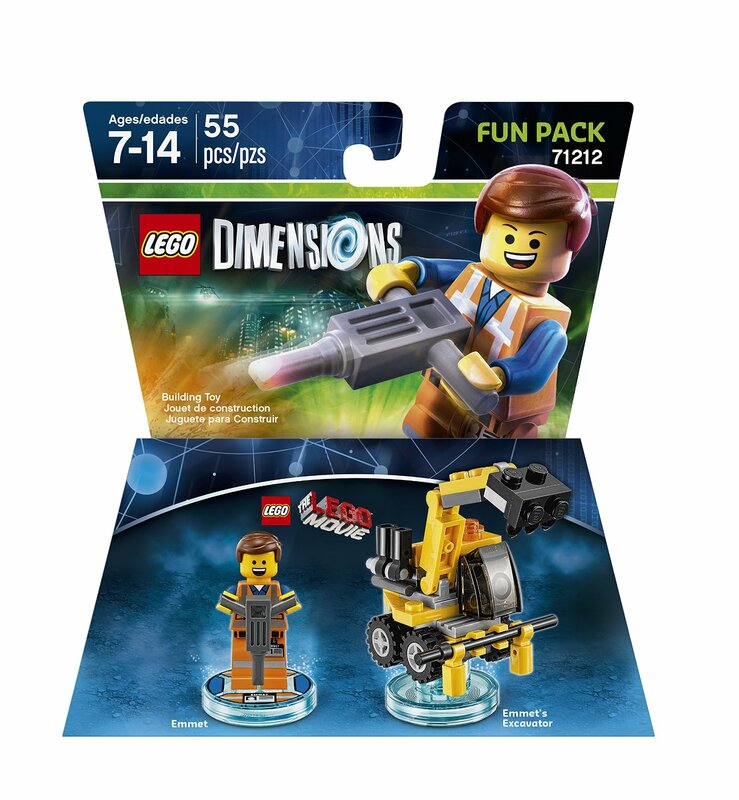 We also won a bid on eBay for Emmet for seven dollars, including shipping, so that concludes our LEGO Dimensions shopping. I might wait two months and get him Fantastic Beasts in March and maybe one more item but we have plenty of content at the moment. 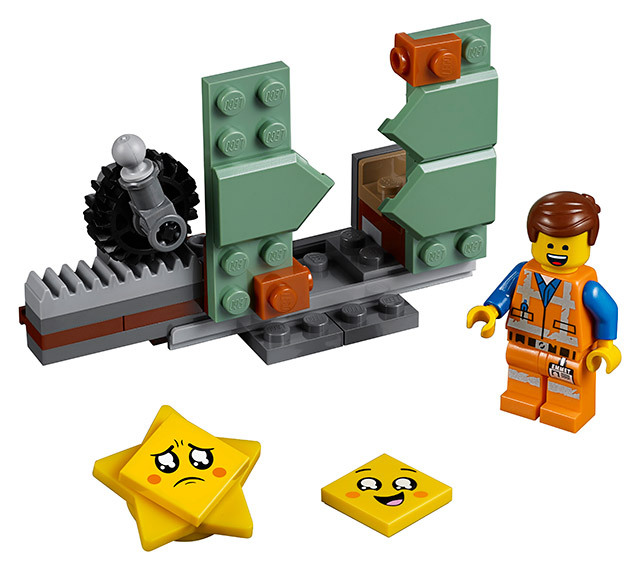 So Walker will be happy, we told him if he really wanted Emmet, he would have to pay for it. He has five dollars and I’ll probably do that bad parent thing of pretending to take the five dollars and then sneak it back in. His mother keeps his wallet at all times, so he’ll never know one way or another. Sometimes he’ll ask how much money he has and then I’m reminded of how much he has but he rarely wants anything that isn’t a dollar or two. Now I really want that Supergirl figure but unless I’m just given $60 for no reason, I doubt we’ll ever get her. She does have a few abilities we are still missing. She has Ice and Freeze Breth, powers (only two others have it, Blossom and Superman), Invulnerability (something that has yet to come up but would have helped during Portal 2 moments), and she can turn into a Red Lantern, but that’s not something I’ve seen that we need thus far. She can construct LEGOS which is an ability Buttercup has and I don’t quite remember seeing when we did the Powerpuff Girls World but we must have. 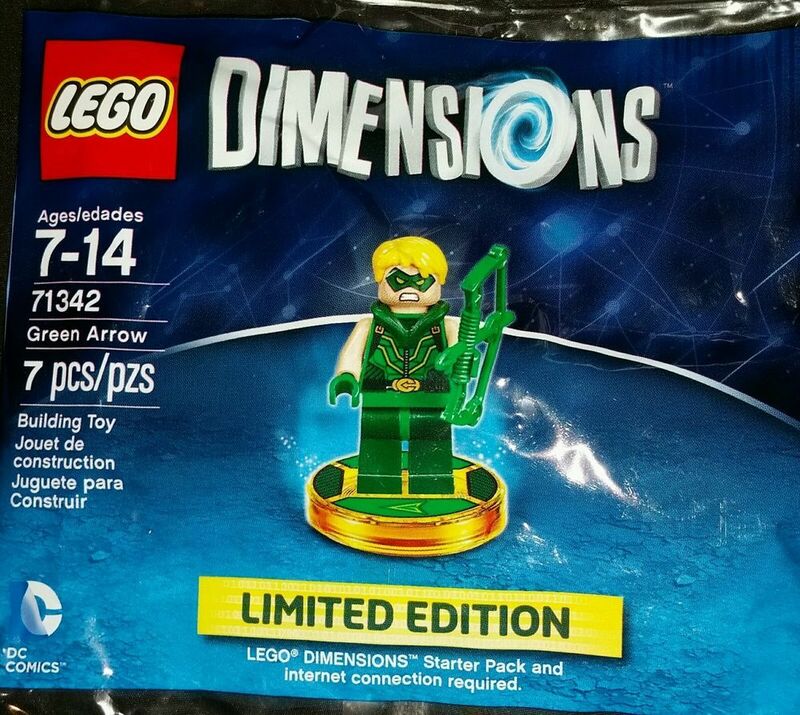 I just checked eBay again and the cheapest I saw was $49.99 and the most expensive was a $70, some are combining her with Green Arrow for well over a hundred dollars but luckily we’re no longer in need of both. The Teen Titans Go world has a Sonic race that was the first one of those I saw. Starfire did pretty well until it got to a loopy loop section and I gave up. There is a jumping race that Lego City world has that I tried several times and I’m just 20 seconds too slow so I’ll have to come back to that one eventually. I’m not sure which character is the best for acrobatic races but it isn’t Robin. Though I’m sure they are all the same and it is all operator error. Though there is a difference with character’s swimming abilities and some vehicles are noticeably better at flying too. I’m going to try to do at least a heads up post about the free games, I meant to do this much earlier but you still have time to download the free games from the PlayStation Network. Thanks to redditor, Bocarprowler, for providing the original links and creating a thread with the games. I haven’t had a chance to play any of these but I’m glad people were able to figure out how to get Amplitude to be cross-buy. Thanks to PlayStationGrenade for hosting their always excellent video summary of the game. Thanks to Platinum Chasers for reviewing the games with a trophy hunter’s experiences. Steep is a snowboarding game. 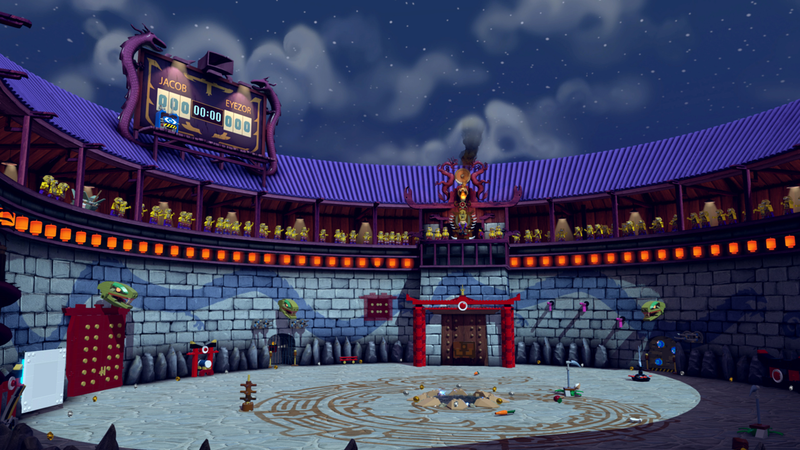 Portal Knights is a Minecraft inspired game with a storyline. Amplitude is a Guitar Hero rhythm style game but with space ships instead of a guitar. Fallen Legion : Flames of Rebellion looks like a fun RPG game. Doesn’t seem like that much information is available about the trophies. I’ll probably try Amplitude and Fallen Legion eventually. We have officially one more month of PS3 and Vita games. PlayStation is going to stop offering these games in March but we’re still not sure if that means March offers PS3/Vita games or if that is the first month that those systems will no longer offer those games. I’m hoping for a stellar March to send those systems off with a proper farewell but I have no idea what games would even fall in that category. If it is Uncharted : Golden Compass, I might have to buy me a Vita that month as I want to play that game so much! But everyone says how hard it is. I might play Steep just for the fun of it. 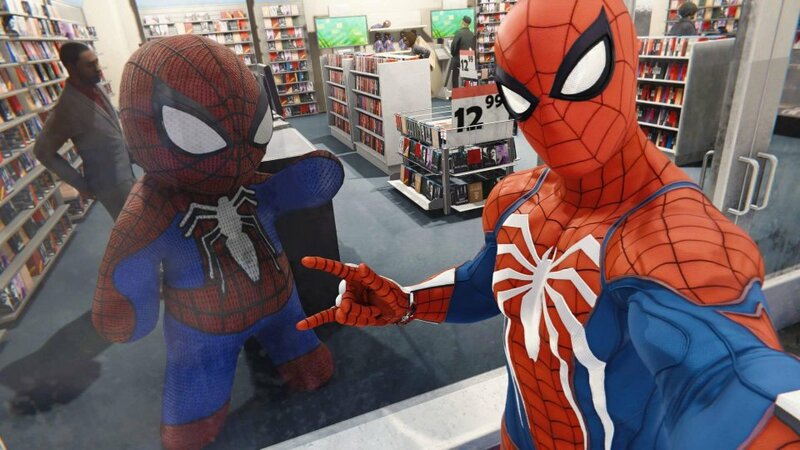 I was so excited about Spider-Man that I knew I wasn’t going to make time to play any of these free games. Maybe in February I’ll start that goal. I guess the best thing for me would to make this type of post to get the word out on it (not like PlayStation really needs my help with that) and then try to make an end of the month post where I provide my experiences with the games. I supposed I still have time for that with the January games but it doesn’t look like that will ideally work out at this time. One of the things that is getting in my way of games is my current obsession with PlayStation Access. 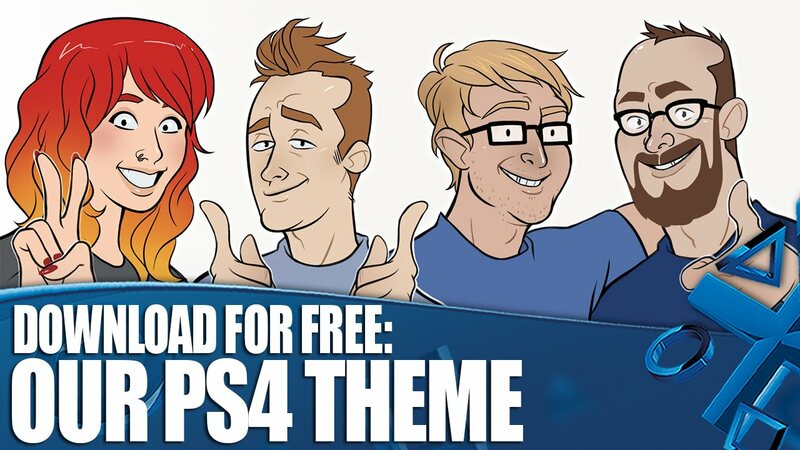 Thanks to PlayStation Access for hosting their video. I went through a spell of watching WatchMojo videos and I kept being shown videos for PlayStation Access but I ignored them until I finally decided to give it a chance. My favorite is Rob as he’s the one that makes a Top Seven list as the Friday Feature. There is a playlist of 199 videos, so he has been making them for at least three years and I’m slowly making my way through them. There is just so much content and with only ten to fourteen minutes per one, one would think I could knock them out easily but it isn’t easy to navigate through the 199 video link as my phone isn’t keeping track of where I left off. It does help that some weeks, I feel I could skip them or I just take the suggested next video but I’ve been enjoying my time with the backlog. Rob makes me wish that I enjoyed Metal Gear IV more, as I just felt lost while playing the game. I do want to pick up Ni No Kuni II one of these days, as that game looks like it will scratch my itch for a good RPG and Persona 5 seems a tad intense for me. He’s also a huge Final Fantasy fan and back in the 90s, I chose Chrono Trigger (I have no regrets) but it made Final Fantasy the other title and I never got around to playing any of them besides a copy of the first game that I bought at a yard sale. 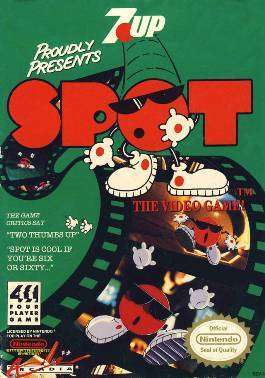 Even that game, I felt lost with but I was young and dumb. I also tried Final Fantasy IV that came in the Final Fantasy Chronicles (that also included Chrono Trigger for the PSOne). I told myself, once I was done with Chrono Trigger, I’ll commit time to play FFIV but I never did. I started it but then I just wanted to play more Chrono Trigger. Rob reminds me of myself, an older game (but he’s younger than me by at least three years), has a young child at home, a wife, and a full time job. He’s usually committing on how he doesn’t have much time to commit to video games but he still plays open world games but he also has an appreciation for shorter more narrative driven games, so we share that in common too. I like how I’ve gotten to know the other hosts as well through Rob’s videos. I still haven’t learned their names but I like them when they show up. They have an app you can download if you are in the UK but it isn’t available in North America, which is a lost opportunity, I think. I was reminded they have a PlayStation theme that I downloaded forever ago as it was free and it had “PlayStation” in the title. That’s Hollie (who just left the show, being replaced by Rosie), Rob, Dave, and Nathan. Dave seems to be the main supporting player in Rob’s videos. I’ve named them as per the bottom image, odd how they flipped Dave and Nathan there. I tried to add Rob as a friend through the PS4 but he’s not accepting friends but I can follow him and that’s good enough, I also follow him on Twitter too. While trying to struggle to find the Access app and to befriend Rob, Walker Dennis thought Rob and I were friends already so when I commented to myself but aloud, about how the friendship was block, Walker was quick to say “Look, Daddy, best friend who block you.” And whenever I am watching one of the videos, he still comments on it, so that’s been fun. I don’t use the theme, of course, but it is nice that it is there if I want to use it. I’m in the end game of Spider-Man, I’ve defeated Electro and Vulture and I’m moving onto Rhino and Scorpion next. We got Walker Dennis the Lego Batman Story Pack for Lego Dimensions so we’ve been playing that too. I also just bought him the Back to the Future level pack through eBay so I’m waiting for that to come in as well, should be next week. I’m also bidding on a Green Arrow for $15 (currently) and I’m willing to go to $20 but $30 is asking too much. Supergirl goes for $50 usually and that’s even way more than I’m willing to pay for a single character. I’m thinking of buying one a pack a month but we’ll see if I stick with that or not. We are so close to getting all of the DLC trophies and I really have my sights on Fantastic Beasts as it is the final story pack we don’t own so that one I’m committed too. Walker really wants Beetlejuice too, as Powerpuff Girls’ red brick provides a big head mode and Bettlejuice offers a Tiny Head mode. Plus, I still regret not just buying it when I had it in my hands at Wal-Mart. So I refuse to buy it for more than ten dollars and I’ve seen it for that much on eBay so it is a matter of time now. Maybe in March. 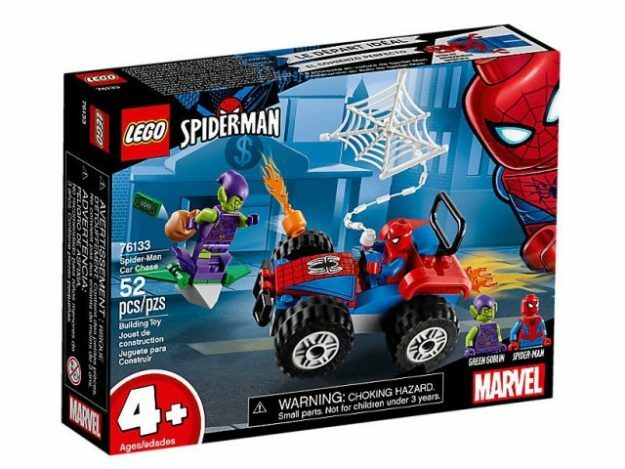 As long as he has the gold bricks to instantly upgrade the vehicles, I’m tempted to buy him a new pack. He has 52 currently, so that’s five vehicles or items so we have time. 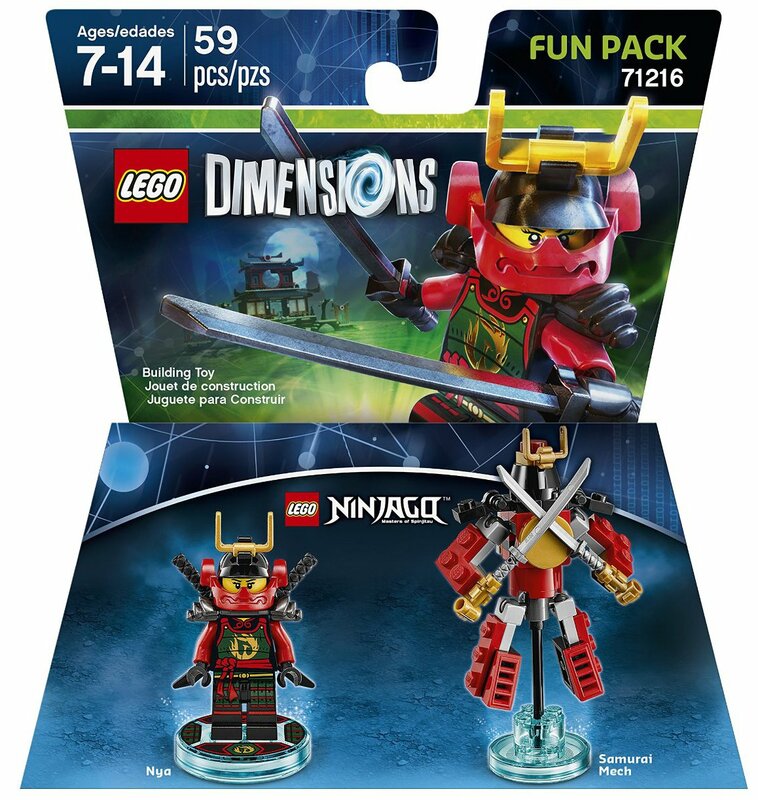 Plus, each pack essentially offers more gold brick opportunities so it all works out. He had 104 gold bricks at one point but after Christmas, he had seven until we started actually playing the levels. It is so satisfying getting all of the minikits from levels and rescuing characters. Besides the trophies from level and story packs, it pretty much is only for bragging rights at this point. We are at 86% completion rate though, which is cool. But we’re so close but these last three are usually $40 each and that’s way too much but if I can bid on something low, that’ll be nicer on the wallet and my mind. Walker really wants Emmett, who also goes for like $20 and we don’t really need him with how Chase McCain does everything Emmett does and so much more, but with Lego Movie 2 coming out, it makes sense that Emmett is in demand. Walker is obsessed with Lego Batman right now, watching the movie on VUDU whenever he gets the chance, so he really wants the Joker and Harley Quinn back and Bane too. He also wants Excalibur Batman, who isn’t even in that movie!, but he comes with the Sword ability that Finn also has, so that’s at least one benefit to Excalibur Batman. Well, until we buy the Adventure Time pack. 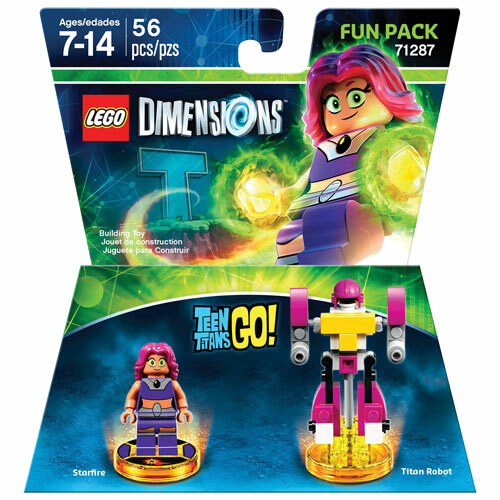 So those are my Lego Dimensions goals.